Automatically download book details by ISBNLike author, title, publisher, genres, subjects & cover art. Just search our huge online book database ... ... by ISBN or by author & title. Install on your phone or tablet. All data stored on your device. All data stored in CLZ Cloud. Install on your own PC / Mac. All data stored on your computer. The purchase includes all app updates and online services. The app can be used on multiple phones and/or tablet, without paying again. TIP: Visit our CLZ Shop for bundle offers with the desktop or web-based software. 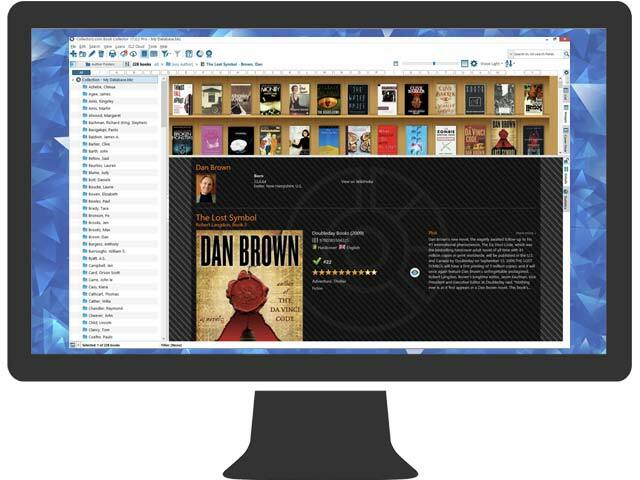 Book Connect is subscription software, costing USD $29.95 per year. This subscription fee includes all software updates, online services and customer support. The software can be used on as many computers or devices as you want. 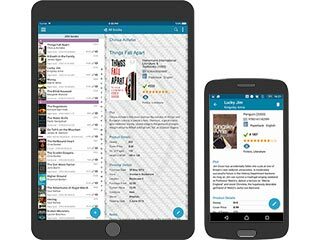 TIP: Visit our CLZ Shop for a bundle deal with the CLZ Books mobile app. A Book Collector License costs USD $59.95 and includes a 1-year Service Plan. After the first year, the Service Plan is USD $29.95 per year. You can use the same License and Service Plan on multiple PCs / Macs. 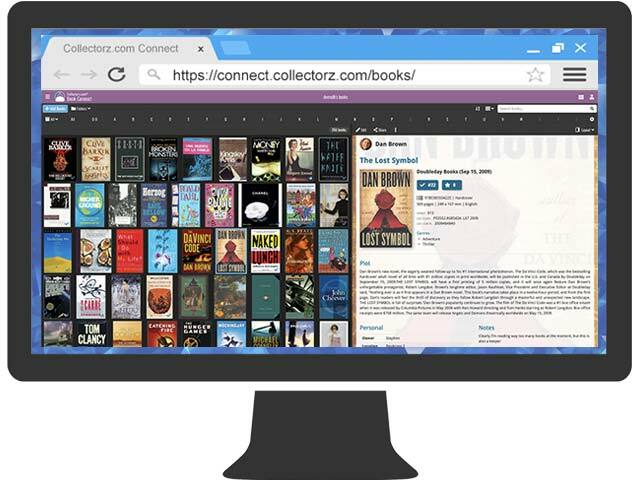 Synchronize your book database between the desktop software, mobile apps and the Connect web-app. View your list online and share it with friends and family. Always have an online backup of your book database. What can I say? I love my Book Collector. I've so many ebooks and physical books its overwhelming. Before I bought your software, I had double and sometimes triple copies of books I'd already purchased and now, with your software I can stay on target with my books and copies are of the past. I have no funny anecdotes to share but I am very happy with my Book Collector and thankful that you had the foresight to create such an awesome program to make not just mine but other people's collections, be it books, music, games, movies.... such an easy way to keep us organised that we no longer have headaches trying to find what we want to read, watch, listen to or play. I also am very happy with the prompt responses to any questions I may have. I have you as a friend on Facebook and have not hesitated in asking questions. Your responses have been precise and fast. I like that. It shows you listen to the consumer and do your best to give us what need. Thank you for that. I also love the app that works wonders when I'm in the bookstore. I can check my collection and add my purchase or just add to the wish list with the bar-code. That is just another part of your Collectorz software that I am happy to have in my devices. As Library Coordinator for our chapter of a national environmental organization I use Book Collector to stay organized. The software makes the lending of books a breeze. We have over 230 books which some of your respondents would scoff at but, since I haul the books to monthly meetings, it is plenty big enough. Book Collector is the perfect solution for anyone who loves books. It’s extensive functions allow tracking of anything and everything about a book and how it is used, but not daunting if its only purpose is to manage a home library. The website is easy to use and the online manual is well-organized and clearly written. As a blind computer user with Apple’s screen reader, I am always so grateful to find such a high degree of accessibility in a program like this. It is a blessing to be able to manage my home library without the need for much sighted help. It is a credit to your programmers that the program is accessible. They obviously took care to meet the guidelines for its support. I suppose that not many blind folks care about books. My blindness came on in my 30s so I had a house full of treasures I wanted to recall, organize and pass along to my son. Audio books have kept me sane but there is nothing like a book in hand and turning a page. I fear before too long too few will be able to know that pleasure. I have enjoyed working with you. Your communication skills are outstanding. I hope that whoever pays you recognizes the value in that . This is an excellent app! It makes physically organizing your book collection on shelves a breeze. Plus, no longer will you have to get up and search through your collection to find if you have a title by a certain author. You can scan your collection in a matter of seconds in order to find out. Thank you for your speedy responses with answers to my questions. As you explained, my scanner works fine with your software and is making logging my books seem almost magical. My daughter introduced me to your software a couple years ago, but I was slow in getting started – shame on me! One reason your software is such a gift to me is that about 11 years ago while logging information on about 1500 books on index cards and on my computer, a flood hit our area and our home was affected. I lost about 700 books to the flood and never went back to update my personal library. Since that loss, I’ve purchased many more books to add to those remaining – and inadvertently bought some of them more than once, hence my need for better organization of my books – and with your software I’m quickly updating my records. Within a short period of time I used my scanner to log nearly 400 books and have asked my granddaughter to come and help me with the rest of the project in a few weeks after she graduates from high school and before she heads off to college. We look forward to working on this project together. What a treat it is to watch those books jump onto the screen with all pertinent information, just by using a scanner and making a few clicks on my keyboard to save what popped up. I was pleasantly surprised when seeing more book and author details than I was aware of, too – including links for information on Wiki... The list is great and has such a great user-friendly sorter by title or author. When browsing around and clicking on the Images tab and seeing the books lined up on book shelves, I actually leaned back and laughed with surprising joy. Clicking on the Cards tab showed me the little cards complete with each book’s information, and I was amazed. My husband gave me book collector as a Christmas gift to catalog my collection of 4,500 books. When I went to book sales, I sometimes purchased duplicates of books I already owned. With the export function of Book Collector, I put a list of my books on my cellphone and now check the list before I buy another book. In addition to organizing my book collection, your product has saved me from wasting money on duplicates. Sending greetings and gratitude to you from the beautiful San Francisco Bay Area. Your creation is a dream come true for me! I have thousands of books to get cataloged and organized. I have been wanting to do this for years and you have made it so simple for me. Over the past several days, I've been using this app to index my book collection. The barcode scanner works great! One helpful hint, especially for paperbacks more than a few years old: use the barcode inside the front cover, not on the back of the book, as that's the one you can count on for containing the ISBN. If you want to do more than just upload your books, i.e. organize your books by genre, subject, or tag, it can be a bit tedious, as each book must be edited individually. However, if you just want to scan in your book collection and are happy with organization by author and the existing genre and subject labels that come with each electronic book record, you will be good to go. I've not tried other book indexing apps, so I can't say how this might stack up against the competition. However, I like the simple interface. It's also nice to be able to organize and view my book collection in so many different ways. I like the hard work you guys put in to build the best book collector's organizing set of tools that will enable me to do just that with all my books. I purchased all the tools but have yet to get it entirely functional because I have too many other things going on right now too. But with a little more time I will be set up. I am anxious to discover just how large my personal collection is (my guess is about 2,000 books), to have it organized, an to enjoy the full functionality of it all. I will be happy to share before and after photos of my current mess versus my organized structure that is one of my primary projects now, including a new custom build home library with floor to ceiling bookcases in my office. I did it almost twice now: I bought a book that I already have! So I have been searching for a program where I could scan the ISBN bar codes of all my books and let those go into a database. Well, I found the perfect program: Book Collector from Collectorz.com. I bought the small laser scanner with it and started scanning the first shelf. This is so much fun. Although the program doesn't find all my books (some of my quilt books are really old and not in print anymore and some front covers are missing), it is still worthwhile to get it all organized.